Happy Manicure Monday everyone! Hope you are surviving the polar vortex because it is insanely cold here - I really wish it was a long weekend and I could have just stayed home watching movies and snuggling under the blankets! So, today's manicure should at least brighten things up! After the whole last month of doing nails I wouldn't normally do, it feels so comfortable to get back to nails that feel very much me - pink and girly! 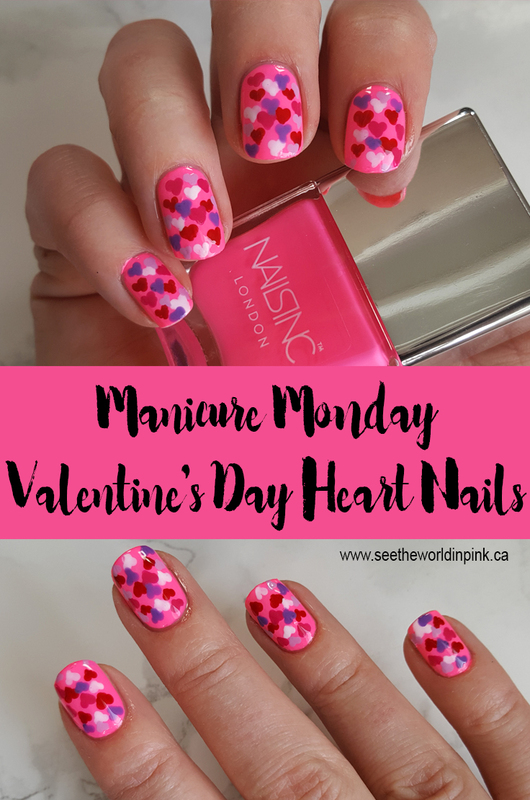 For this week, the #CBBxManiMonday chose "Pink and Red" as our theme and I went full Valentine's Day with the nails! I was heavily inspired by a past picture from MakeMyDay that I saw years ago and have been wanting to do ever since. I can't find the exact picture now; but, it was just layered mini hearts and it was so perfect with the colour we chose for the week! For this look I started with 2 coats of a neon pink base polish (I used Glamingo) and let this dry well. 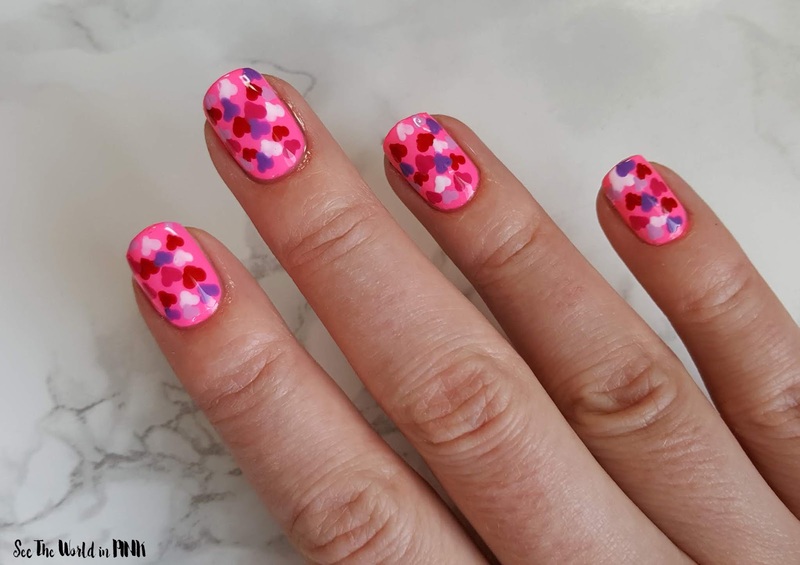 Then using a dotting tool and 1 polish colour, I creating a dotting tool nail art heart, where you dot 2 dots beside each other and drag the dot down (here is the original tutorial!) 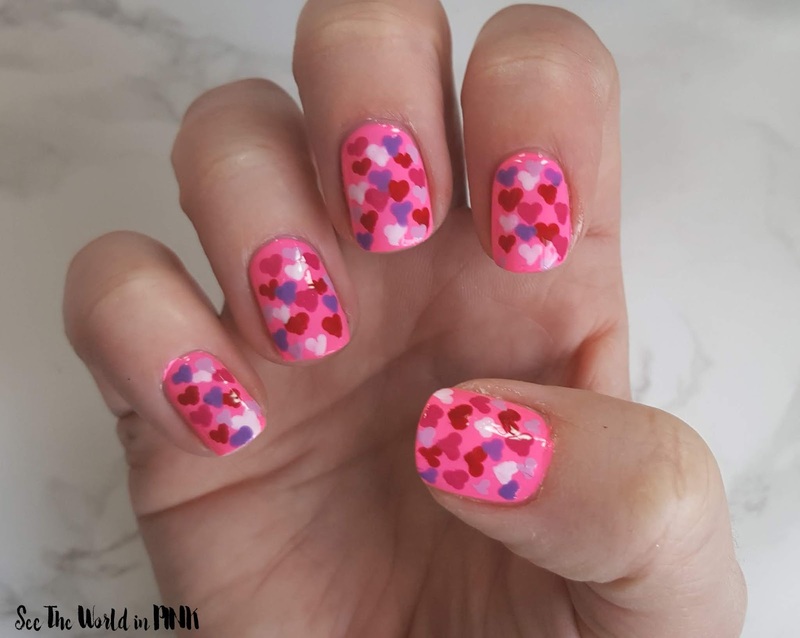 I created a couple of hearts with each different polish shade and varied sizes and placement. Then, I let the hearts dry well and finished with a nail art top coat so the hearts wouldn't run (I am the worst for not waiting long enough and having my nail art designs run!) This Morya SP Top Coat I received in a mani subscription is really great so far! I absolutely love how this design turned out!!! I was worried that the purples and reds for hearts might not "go" together; but, they turned out just like I pictured! Also, I think this design looks great on short nails and I just had to trim mine down because of some breakage and was worried it wouldn't look as good! The neon pink polish is so bright and fun too - it's nice to have nails that are very "me" back! 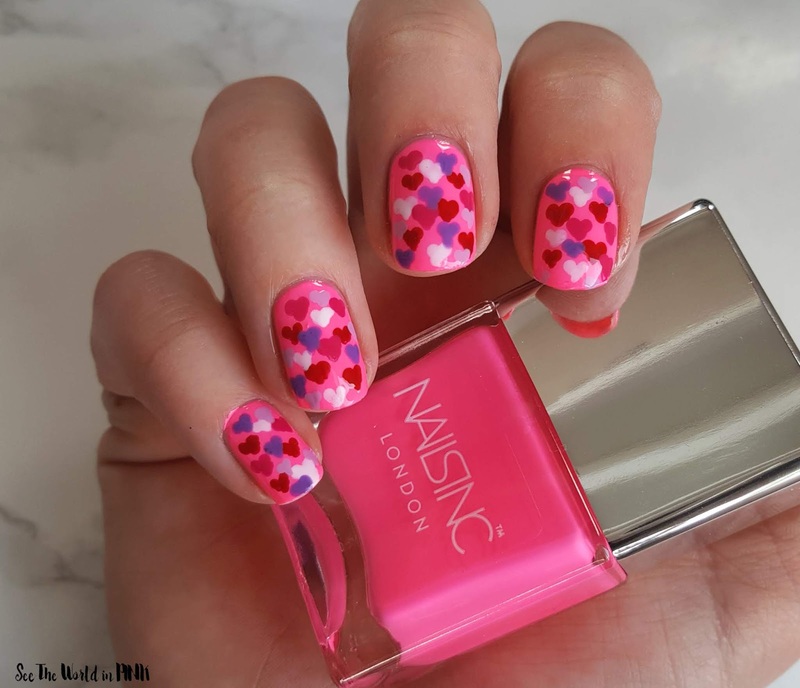 Are you rocking Valentine's Day nails yet?! 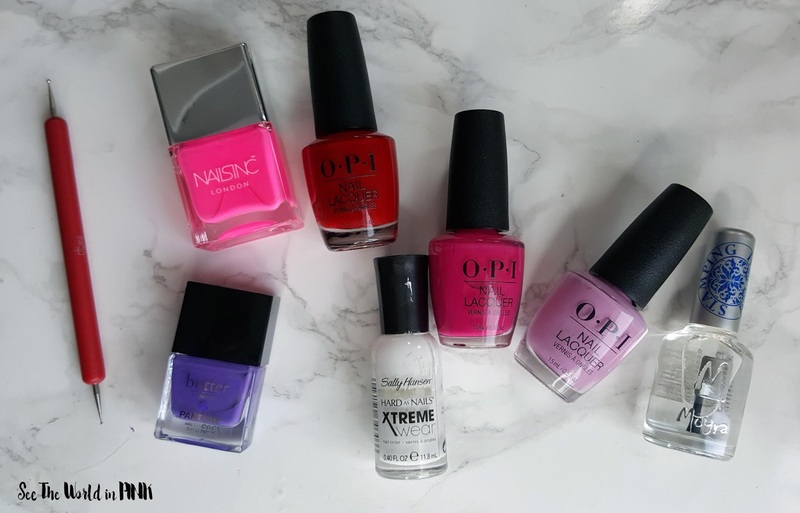 As always, make sure you check out Cosmetic Proof, Prairie Beauty Love, and Tea & Nail Polish to see their take on "Pink and Red" nails! Your nails look so cute! Pefect design for February too! OH my this is so cute and looks easy. I love the layering of all the shades for the hearts. Yes, surprisingly easy! They don't need to be perfect - I love how it turned out! I love all the little hearts, so cute! How cute is that manicure!! I wish I had the patience to do that! Thank you! It did take some time; but, was worth it - it's totally my girly time!